Description: Unframed diploma. 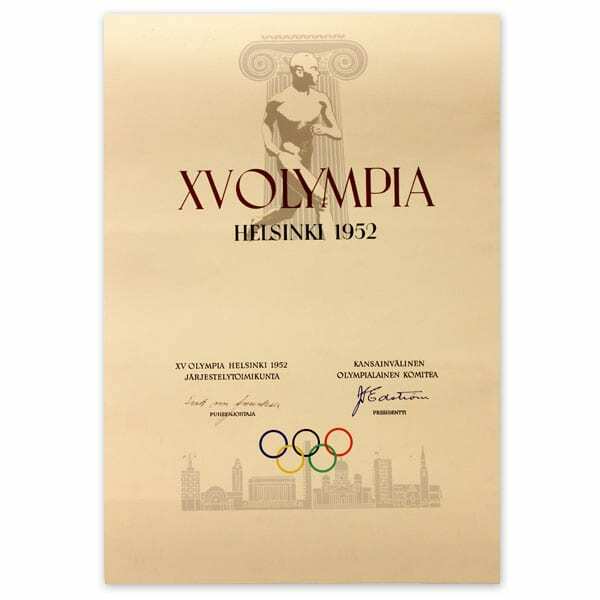 In the upper part the statue of Paavo Nurmi in front of an Ionian column and the text: XV OLYMPIA HELSINKI 1952. In the lower part the signatures of Erik von Frenckell (under the heading: XV OLYMPIA 1952 JÄRJESTELYTOIMIKUNTA) and J. Sigfrid Edström (under the heading KANSAINVÄLINEN OLYMPIALAINEN KOMITEA). Below the signatures the Olympic rings in colour and drawn silhouettes of major buildings of Helsinki. Other information: The diploma was printed in both Finnish and Swedish. It was awarded to all athletes and teams that placed in the top six in their events.